Historians have always privileged the written over the spoken, and the visual over the aural. It’s no wonder: few of us consciously document the sounds around us, and it is only occasionally that we become aware of their passing. Think, for example, of the flash of recognition that you probably experienced the first time you heard that current mobile phone ring tone that replicates the echoing, mechanical bell of an old fashioned, black, dial-up telephone. I think of the little ‘tune’ that modems used to play when you were connecting to the Internet: it was a sound unheard twenty years ago, and probably will no longer be heard twenty years hence. Then there are familiar childhood sounds that time and development have erased: the ‘chuck-chuck’ of a rainbow sprinkler on the front lawn, the sound of the milkman’s horse. 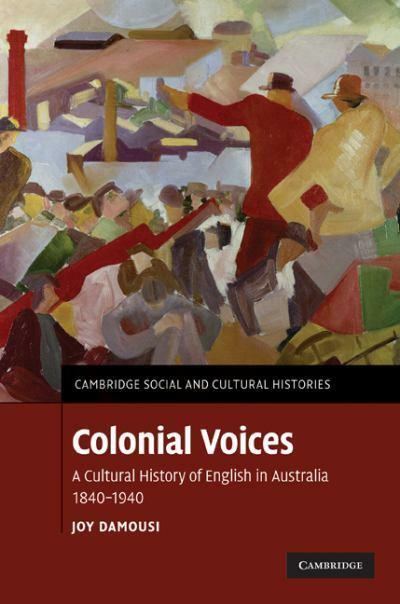 Joy Damousi’s book Colonial Voices focusses on the Australian voice in particular. As I trawl though my 1840s Port Phillip documents, I’ve found myself wondering about the actual, physical voices that would have accompanied the words that I am reading. How, for example, did speakers get themselves heard at these rowdy meetings in support of, or against, Judge Willis? In a new community supplemented constantly with waves of new immigrants especially from Britain, and the stream of colonists from New South Wales and Tasmania (some of whom were native born), did people lose their accents within a generation as seems to occur today- or is that only with NESB people? Did the Australian-born child of a Scots family sound different to the Australian-born child of an English family? Colonial voices were not superimposed into a silence: Aboriginal voices were raised, and then largely suppressed. The first chapter of this broadly chronological book investigates the role of missionaries and educators in teaching English to Aboriginal children in an attempt at first to make them English, become English, and also as a way of drawing a dichotomy between savagery and civilization. The second chapter examines the emergence of public speech in Australia during the 1840s in the male-dominated political and public arena- and here of course, I read closely, aware that the controversy over Judge Willis was carried out in this milieu. Chapters 3, 4, 5 and 6 examined the phenomenon of elocution, which was promulgated through books, classes, speech nights, eisteddfods and paid performances. At this point of the book, I felt as if I was stuck in a bit of whirlpool. Many of the examples quoted seemed rather repetitious, and although she distinguished between expectations exhorted from overseas and those that emerged from within Australia itself, their content seemed pretty much the same. While at pains to emphasize the celebrated status of various practitioners, their names mean nothing today and although this section of the book covered about 60 years, there did not seem to be much difference from one decade to another. The narrative picked up, however, from Chapter 7 onwards. Vita Goldstein and Alfred Deakin were used as two examplars of public political speech, at a time when political speech was a way of agitating for political change, and when the relationship changed between speaker and audience from one of recipient to participant. During WWI, in Chapter 8, there was a move towards a less formalized form of public speech, and elocution was now seen more as a distancing mechanism. Mourning and commemoration ceremonies, soldiers’ slang, and school-based patriotism encouraged a distinctive Australian eloquence. She picks up on the debate about the “Australian sound” in Chapter 9 that was carried out in literacy circles and etiquette manuals. This debate was heightened by the introduction of radio, discussed in Chapter 10, both as a form of connection to the wider British Empire, but also as a way of creating and promulgating an Australian Sound. The introduction of sound to film and the dominance of American film in particular, is discussed in Chapter 11, leading us up to the 1940 cut-off for the book. This book took me into byways and places that I did not expect. I liked the emphasis on gender that ran throughout the book, especially in the chapters on political speech. However, I was puzzled by the relatively slight treatment given to the bush nationalism evoked by Lawson and Banjo Patterson which, even today, are the backbone of a particular form of oral performance. I think of the School Readers, produced between 1927-30 and still in use even within my own educational history during the 1960s, and how poetry in those books formed the basis of oral performance in schools. I was also disconcerted by the prevalence of small proof-reading errors, especially in a book published by Cambridge University Press. I counted six which seemed to cross some sort of threshold for me, making me hyper-critical of editorial foibles. It was all rather paradoxical (or was it some form of reflexivity?) , given that much of the book was devoted to concepts of ‘correctness’. However, a marker of whether a book is working on you, might be the way that you notice things with new eyes, or in this case, ears. I was sitting reading the book, conscious that a workman was talking loudly on his mobile phone in the driveway of the street across the road. Likewise, I could hear a construction worker on a block in the next street on his phone. I could not catch every word, but had I concentrated I could have followed the one-sided conversation. I set Mr Judge, who is fond of such puzzles, to work out how many people would be able to hear a speaker in a crowd without amplification. He estimated that to speak to a crowd of 20,000 people, you would have to be able to project your voice to a distance of 60 metres. Take it from me, the chippies and builders of Melbourne can do this with bells on. I hope someone has put the dial in modem sound on You Tube. I haven’t heard it for so long. My ring tone resembles the old phone ring but once I downloaded a recording of an old telephone doing the double ring. It frightened the horses. My paternal grandfather spoke much like working class Australian’s do today. My maternal grandfather spoke quite differently. It couldn’t be described as posh, but it was different, perhaps similar to how politicians like Curtain and Lang spoke. You could hardly say there was a single Aussie accent, but isn’t it amazing that within a couple of generations of white Australia, our own accent had developed. However thankyou for drawing attention to this book… it seems to be picking up many of the ideas that Damousi has been pursuing over a number of years. I can see that if something like this prompts one to listen afresh to what is going on in one’s surroundings, then it is working. I have probably misrepresented Damousi’s treatment of Aboriginal voices in my quest for brevity! She mentions many of the things that you have spoken of here. She speaks of the pride amongst the missionaries in the acquisition of English amongst the mission children, and she has a section on translators in court (which tied in with Anna Johnston’s work).